The B & L firm was founded by two immigrants from Germany Jacob (later calling himself John Jacob) Bausch and Henry Lomb. Bausch was both an optician and woodworker by training. Their company first became succesful with the use of hard rubber eyeglass frames. This eventually allowed expansion of the business into other optical areas including microscopes. The first patent granted to Bausch was for a very simple Linen prover type microscope(A) in 1865. At least two variations of this collapsable very basic magnifier are known. 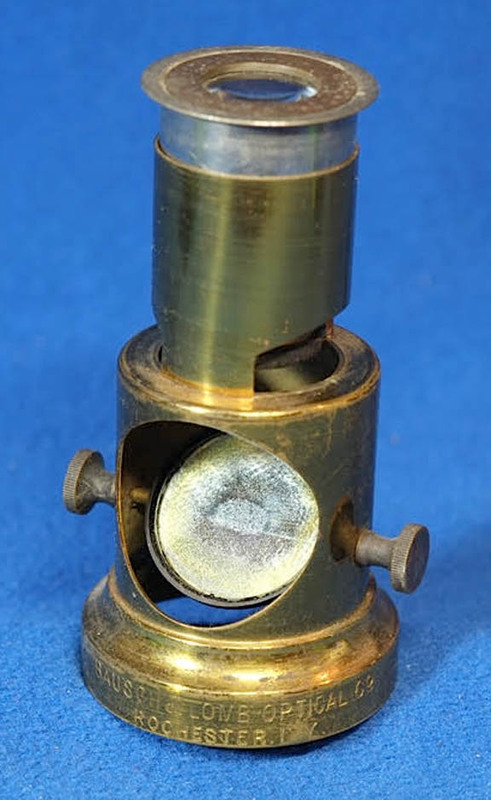 About 1874 B & L started to produce both simple and compound microscopes. The second patent granted to them was again to Bausch himself for the Excelsior microscope(B) in 1874, the same year that B & L issued their first compound production microscopes. The simpler and cheaper American Agriculturist microscope(C) was patented in January 1878. Two variations of the American Agriculturist Microscopes appeared later (see below). Both the Excelsior and the American Agriculturist microscopes were offered as a premium by the American Agriculturist magazine published by the Orange Judd Company. Orange Judd became the editor of the American Agriculturist in 1853 and was the owner by 1856. By 1864 this magazine had a circulation of over 100,000. The Judd company offered both the Excelsior(B) and the first version of the Agriculturist B & L microscopes(C) about 1877. The Excelsior was sent free for seven subscriptions ($1.60 each) or $2.75 without a subscription. At the same time, the cheaper and simpler Agriculturist microscope(C) was offered. It was given for a subscription plus 40 cents. By 1879, although the company was suffering from the effects of the recent depression, they began to offer the American Agriculturalist Compound Microscope, also produced by B & L. This 'household' type of microscope featured a hard rubber stage and a wheel of apertures, two features not seen on the other imported 'household' microscopes of the time. The American Agriculturist also offered small magnifiers by other makers; an example was the 'Abbott's Pocket Microscope. The second version of the American Agriculturalist simple microscope(D) with the drum-like base was first advertised about 1890. The Excelsior and American Agriculturist microscopes were offered free for a number of subscriptions or could be purchased outright (the Excelsior was more expensive of course). Judd died in 1892. The Agriculturalist microscopes were typically supplied in cardboard cases, usually green in color, but some were black and some were sold in boxes that were orange-red in color. What all these boxes had in common was the labeling which originated at the Orange Judd company. I have not seen a cardboard box for the Excelsior, which of course did not neccesarily require one, since all the parts fit neatly inside it when it was closed up. Although the cardboard case for the Agriculturalist had only the Orange Judd Company name on it, it is clear that it, like the Excelsior was made by Bausch & Lomb. The base of the first small version of the little agriculturalist was made of hard rubber, just like their eyeglass frames. The 1890 model(D) was based on a nickel-plated brass base that is similar to the familiar brass 'drum' microscopes made mostly in France. According to the various ads in the magazine, many thousands of the Agriculturist microscopes were made. What is also clear is that although Judd supplied both the Excelsior and the Agriculturist, the Excelsior was supplied by others as well, as advertisements for the Excelsior are found in many other publications and even in instrument catalogs. Although Bausch added serial numbers to his Excelsiors, there were no serial numbers on the Agriculturist microscopes. The Excelsior and the drum-version of the Agriculturist were both signed by Bausch or Bausch & Lomb. The earliest examples of the Excelsior are stamped 'Pat App'd For, NN' with NN representing the serial number. There are very few with this signature, for, as one can see by the example in this collection, by the time number 61 was produced, the patent had already been granted. At least two other variations of the Agriculturalist were marketed. The one pictured to the left sat on a tiny nickel-plated four-legged table. This is a less commmon version of the four Bausch & Lomb Agriculturalist-types microscopes, and to date, I have seen no documentation of when it was sold, nor for how long. The examples I am aware of had no box with them. The other one, pictured to the right was advertised in the 'Prairie Farmer' magazine and was called the 'Prairie Farmer Microscope'. This version was never advertised in the American Agriculturalist Magazines, but only in the Prairie Farmer. The Prairie Farmer was still published by the Orange Judd Company though. 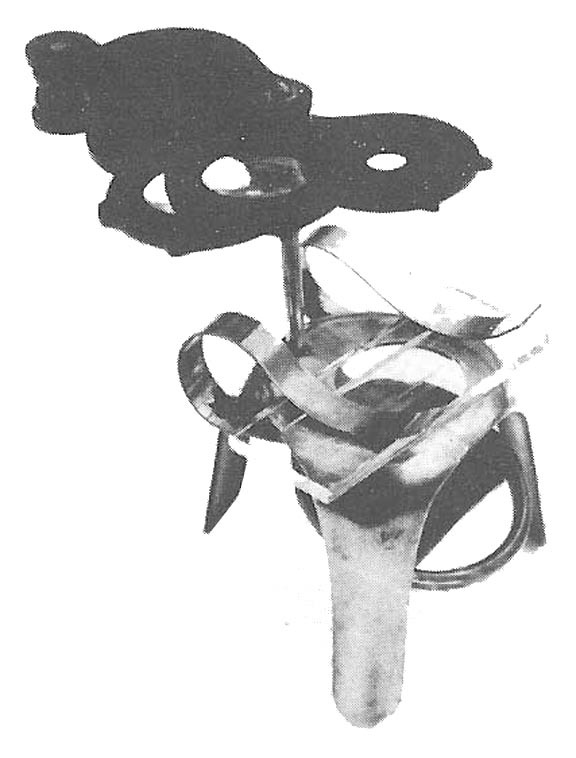 This example came with a box labeled 'The Prairie Farmer Microscope' The bottom half is similar if not identical to 'D' above, while the upper half supports a compound lens instead of the combination of simple lenses that 'D' supports. There is a slit in the upper tube over the stage to allow small slides to be viewed. It was advertised in the Prairie Farmer of 1886. 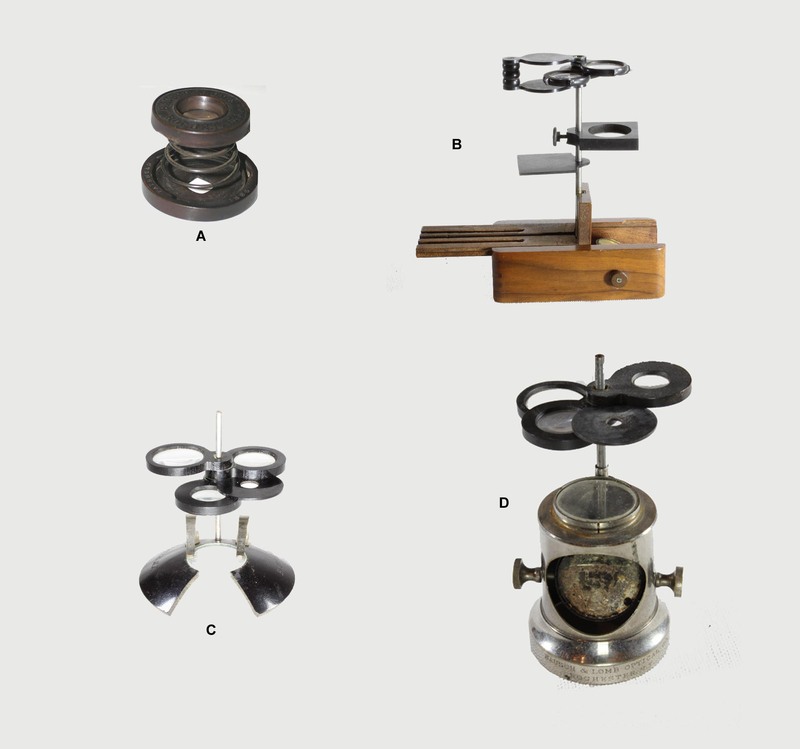 Bausch & Lomb made several types of simple microscopes in their early years, starting about 1865 with the collapsing simple Linen-prover type microscope (A), which is not in this collection but is pictured for reference. This collection contains two examples of the first version of the 'American Agriculturist' microscope, one example of the 'Excelsior' and one of the second version (drum type) of the 'American Agriculturist.' Another collector was kind enough to allow me to picture his example of the simple collapsible microscope(A). The author is grateful to Allan DeHaas for allowing me to use his images of the Prairie Farmer Microscope. An example of the Four-legged version of the Bausch & Lomb Agriculturalist, formerly in my collection, is also pictured. The table below gives a brief summary of pertinent dates and other relevent information concerning the early Bausch & Lomb simple microscopes. Click on the images for a page about each model. The author would like to acknowledge Dr Joe Zeligs for allowing me to picture his example of the early collapsing Bausch & Lomb Microscope and for his keen observation that it was intended to be used, perhaps among other things, as a linen prover.